This latest “A view from the line” post takes for the first time a closer look at Canute Road Quay and more specifically the track work inset within concrete along the quayside. USA Tank No. 72 shunts across the inset track. Picture copyright and courtesy Model Rail / C Nevard. 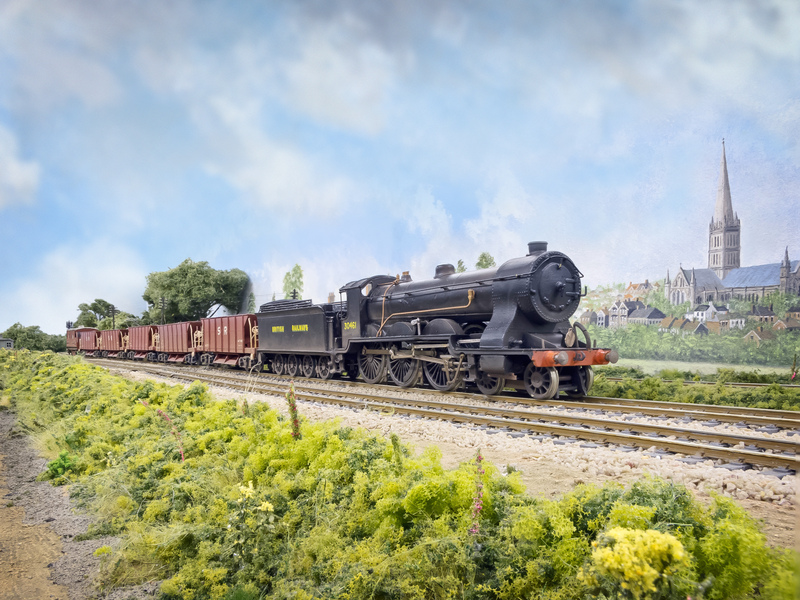 There are a number of methods of re-creating inset track and this post describes the method I have used on Canute Road Quay and hopefully its relative simplicity and the effect gained will be of use to other modellers. Although I have covered the process before in multiple posts about Canute Road Quay I thought it would be useful to details the steps I used in one post. The trackwork on Canute Road Quay is a mixture of open sleepered and inset track as seen around such docks / quays to give some variety to the surfaces. For the open track I have used C & L Finescale flexitrack whilst utilising Peco small radius LH / RH and ‘Y’ turnouts and within the inset track areas plain Peco track. To start with check rails were added inside the running rails, by gluing with lengths of code 75 rail, obtained from C & L Finescale, to every 3rd or 4th sleeper using cyanoacrylate glue (super glue). Then the first layer of 2.5mm cork, the approximate height of the sleepers, was glued down either side of the track, and also a strip added between the check rails. Another layer of cork, this time 1.5mm thick was then glued on top of the original base layer of cork from stage one, that also extends right up to the outside surface of the main running rails totally covering the sleepers. Any gaps were filled using air drying modelling clay. I was careful around the one inset point to ensure that the check rails and the cork were spaced to ensure that the switch blades can still operate correctly (this does leave a slightly larger gap than one might ideally want but it is a necessary compromise). The surface was then painted with Green Scenes textures concrete paint ,I also smoothed the texture slightly once dry as to my eye it was slightly too textured for the effect I was trying to achieve, but was a good starting point. It was then slightly weathered. A representation of the expansion joints between the concrete panels was drawn on, pushing down into the painted cork surface, using a sharp HB pencil , spaced every 60mm to represent 15 foot concrete panels. Then weeds, creeping grass and the such like added using a mixture of grass tufts and static grass. Etched brass Drain and manhole covers, from Langley Models (F73), have been also been inset into the surface at relevant locations. USA tank No. 68 passes the quayside office. Picture copyright and courtesy Model Rail / C Nevard. I hope this post helps explain the process I used in simple stages and will be of use for any others looking to replicate inset concrete trackwork. I am about as far from a horticulturalist as one can get, my own green space outside my home is more of a nature reserve and home to local wildlife than a garden! The nearest I get to green fingers is when the Woodland Scenics scatter material has stuck to my fingers. This post is an attempt to describe how I undertook some of the flora on Fisherton Sarum, although perhaps the photographs speak more than the actual words. Specific flora, especially when flowering, of course will vary depending on the time of year and as with many layouts I have set Fisherton Sarum somewhere between the spring and the end of summer so it is possible that certain plants should not be in flower together, but hey if I can model a time period of 1946 to 1949, a few months here and there flora wise are not really going to matter. 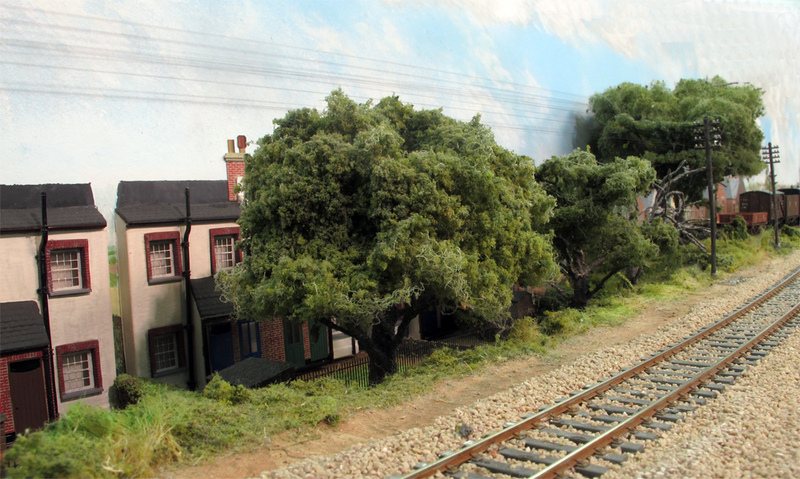 As with most areas of modelling whether it is rolling stock, buildings or scenery referring to the real thing is always the best starting point. Firstly; Embankments, railway embankments are rarely just green grass and certainly never all of the same colour and height. If you look at many roadside verges and embankments the longer grass can be in excess of 3 to 4 foot tall. I have attempted to include a variety of colours and textures accordingly. Once the general form of the embankment was made using Modroc plaster bandage over a lattice card former that painted brown I glued, using PVA, teddy bear fur (no actual teddy bear was harmed during the making of Fisherton Sarum) fur side down with the backing uppermost. Once the glued dried I cut / tore / trimmed the backing off leaving random lengths of the fur sticking up to represent the yellowed / dried longer grass. I then added different textures and colours of other grasses / ground cover plants using a mix of grades and colour tones of Woodlands Scenics ‘Grass’ and ‘turf’ scatter materials. An alternative to the teddy bear fur these days would be to build up layers of ‘static grass’ (but please go for the more yellow colours rather than the bright greens) to give variations in height before adding the other textures which are still required as I feel that static grass alone is too uniform in texture. There are various applicators and static grasses on the market such as the applicator and grasses that I now use from War World Scenics. Once I was happy with the overall effect of the embankment flora I turned my attention to adding a few more specific plants specific plants. I made Foxgloves simply from individual strands of sisal string dipped in PVA glue then fine green scatter material, followed by some fine purple scatter material to represent the flowers. Lady’s bedstraw is the commonly seen yellow plant on verges and embankments was planted in clumps, I cheated here and used readymade and coloured plants from the MiniNatur range that is available from a number of UK retailers. For brambles I used rubberised horsehair teased out dipped in PVA glue followed by once again fine green scatter material. As a material it has been around longer than I can remember and was often used as the basis for hedges etc., but I still think it makes the best brambles. Finally; Trees, I made these using wire armatures that I then covered in Woodlands Scenics foliage teases out over the branches, although I have left one tree devoid of foliage to represent an unfortunately dead tree. 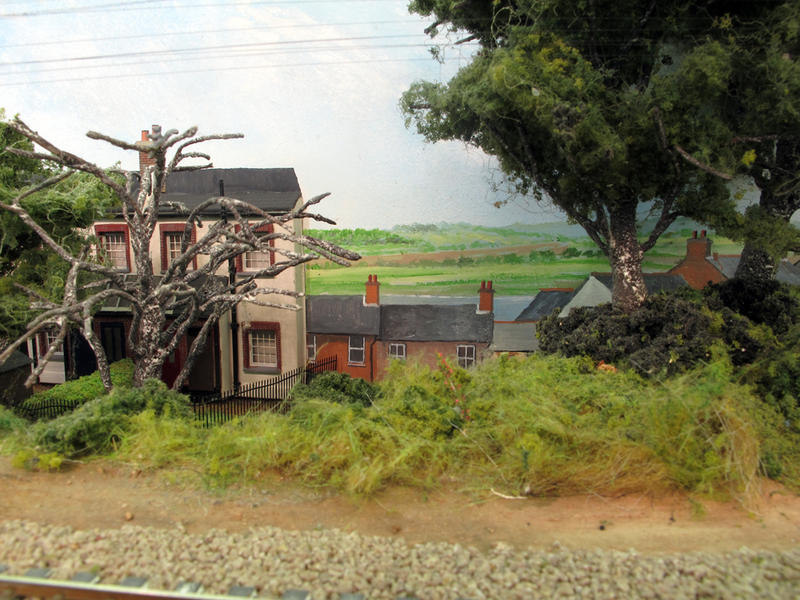 I used this method for all the trees on Fisherton Sarum as they were all generally individual trees, for denser wooded areas then less complicated armatures can be used or alternatives such as sea moss, or actual twigs etc.as the basis for the application of the foliage materials. Pretty basic stuff really but there are few things to note with trees (take a look at the real things when you are next away from your computer screen reading this): a) the bark is rarely brown and is usually more of a grey colour, especially so when viewed from a distance, b) the shape of the tree and density of the foliage does of vary between species and c) a lot of trees are quite tall and mature trees are more often than not taller than houses. I have tried even with a relatively small number of trees to include a variety of shapes and sizes and careful positioning so give the trees the prominence they deserve. As flora and fauna is usually associated together I have not forgotten the various fauna that is also on Fisherton Sarum and will be the subject of a future post. 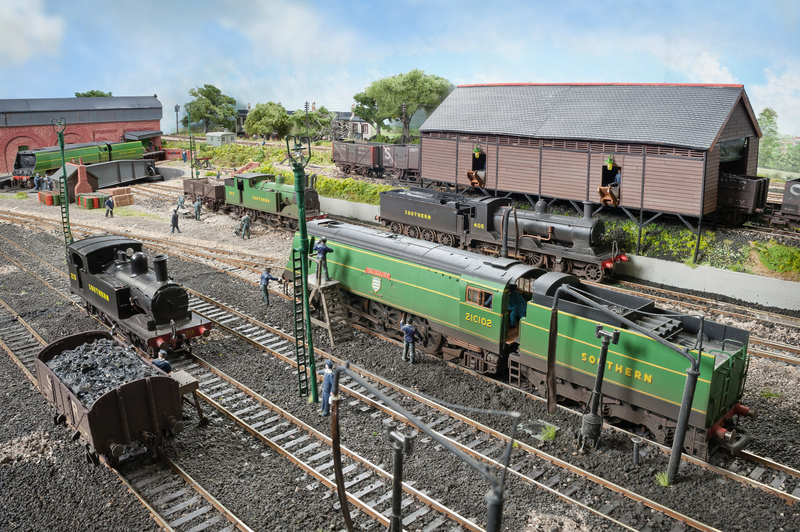 As with many sheds the turntable was a vital part of the set up, engines would usually come on shed be turned, coaled and watered before moving to their allocated shed road prior to their next duty. Depending on the size of shed sometimes physically operating the turntable would have been the responsibility of the loco crew, or as in the case of Salisbury there was a dedicated gang of shed staff allocated to the role. 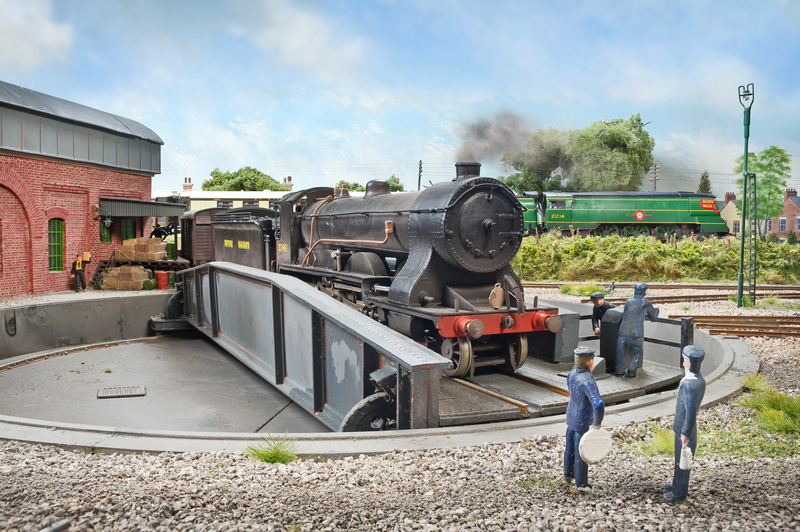 I have on Fisherton Sarum modelled the turners operating the turntable, although these operators are either static or moving so quickly they only appear as a static blur (delete which ever version you don’t actually believe). The turntable itself, is as detailed in my view from line #6 post that can be read here, made from a Peco LK-55 well and deck with scratchbuilt sides, winding mechanism and turners platform for the turners. Late afternoon light catches the turners mess hut. The warning signs to drivers on the approach roads can also be seen. I have also modelled the turners gang mess hut that was provided for them to keep warm, dry and rest between turns. 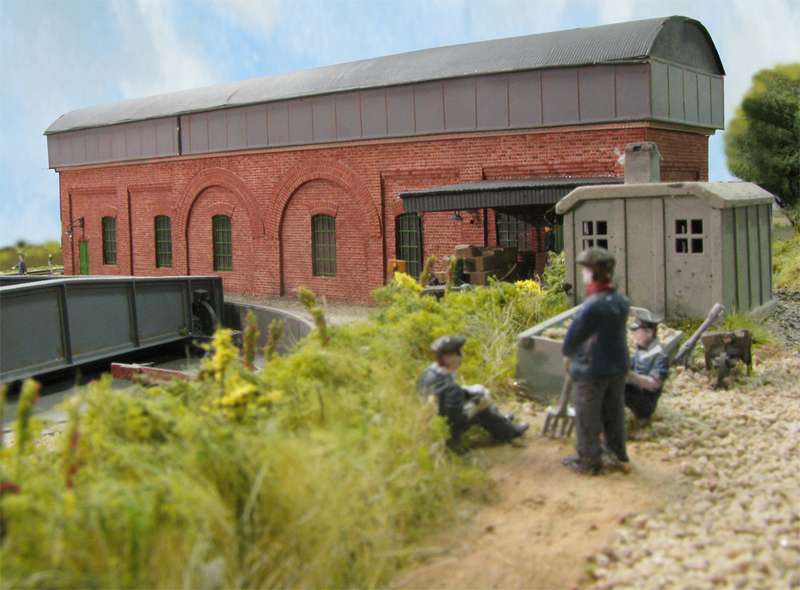 At sheds like Salibury the turntable gang was often formed of staff that had previously been in other roles but ended up in such a gang due to a number of reasons such as medical or eyesight issues. Keeping a job being better than no job. 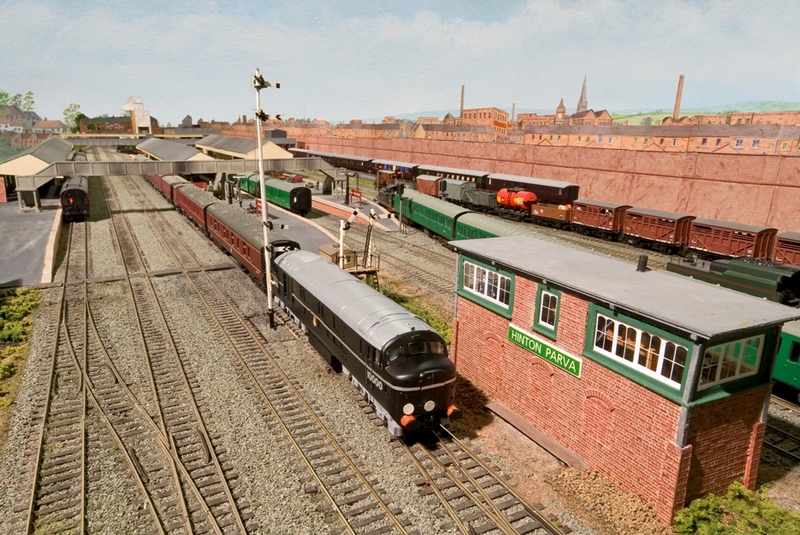 I have made use of a Wills SS50 Platelayers hut kit but with the roof replaced with slate tiles rather than the supplied corrugated iron sheeting to more closely represent the one at Salisbury. Stored outside and around the turners mess hut are barrels of lubricating and steam oil. Signs on the approach roads to the turntable warn drivers not to pass that point unless given instruction to do so by the turners. These were simply made from a short section of rail with a plasticard board and then suitably painted. 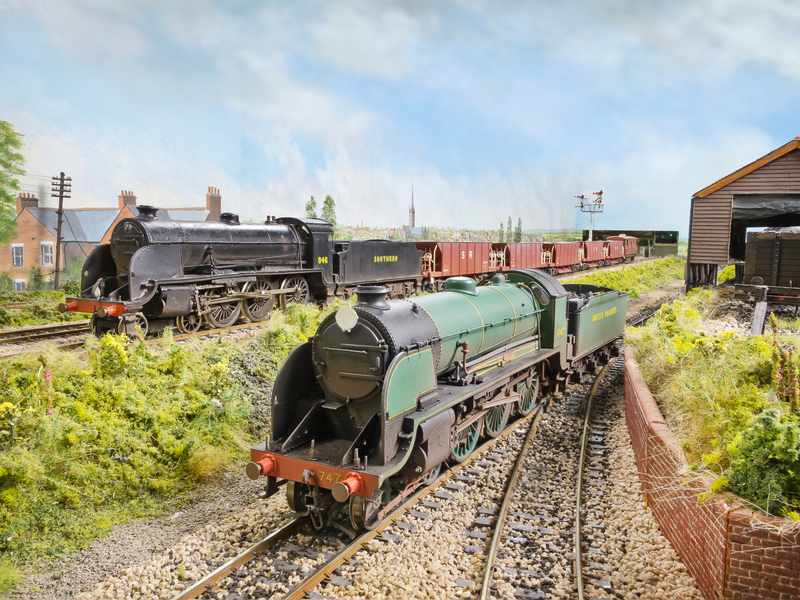 The turntable itself on Fisherton Sarum is very much one of the main focal points of the layout and as stated above it has been described in more detail in my View from the Line #6 post here. 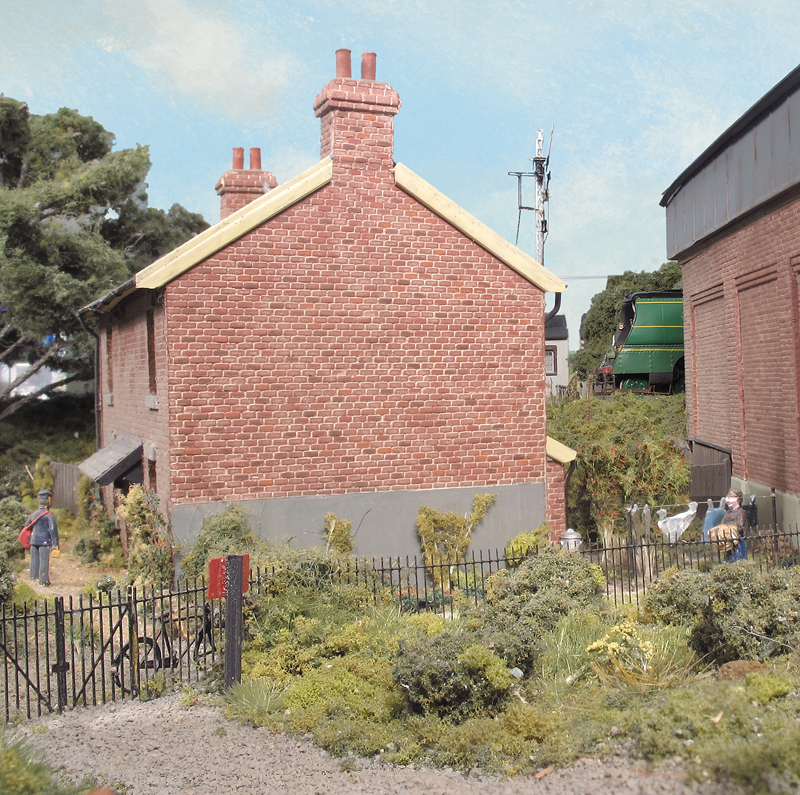 This I suppose only just counts as ‘A view from the line’ type post as in reality it is a guide to my method of painting brickwork that I have used on all the brick buildings seen on Fisherton Sarum. I tend to construct most of my buildings using embossed plastic, mainly Wills material packs, which have more pronounced embossing when compared to for example than the A4 embossed plasticard sheets from the likes of Slaters. The method I am outlining below is also therefore possibly more suited to such heavier bossed materials. Although this post is primarily about brick painting the principles can also be applied to stone work (with obviously a change in the colours used). 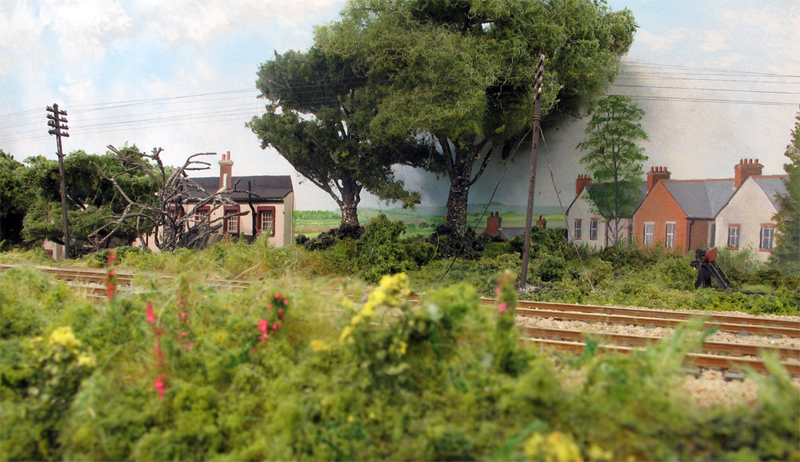 As with any modelling technique be it loco building, tree making, weathering etc. it is always best to start by looking at the real thing and brickwork is no exception. Brick and mortar colours vary by location, age and the prevailing environment. Bricks can be a variety of yellows, oranges, reds through to blue, greys and even black. Mortar can vary from almost white, cream, grey through to almost black the latter especially in old industrial areas that have been subject to heavy atmospheric weathering, mortar and brickwork tends to stay lighter in the countryside than in an industrial / urban environment. 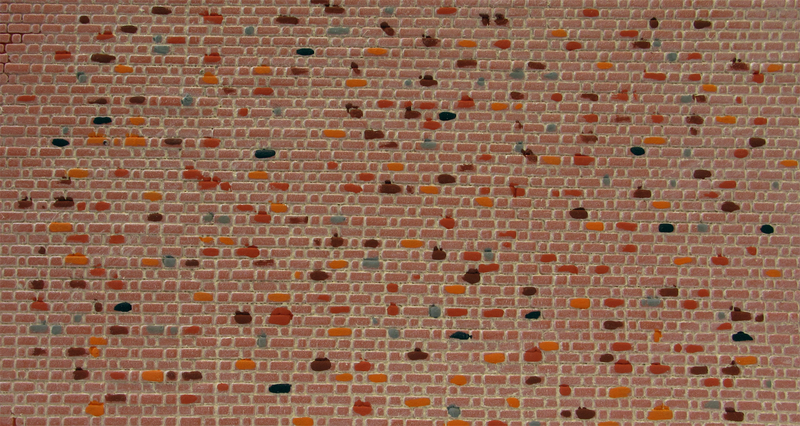 The colours that we see in brick walls also vary depending on the distance that we view the wall from as colour unlike a physical item does not scale in the same way. When we look at a real wall close up we see all the variations of individual brick colours, however when viewed from a distance the colours tend merge into a smaller more uniform palette. In model form we actually need to view from a far greater representative distance to achieve the same effect therefore if each individual brick on a model is separately painted whilst this would correct in close you would have to stand back a proportionally greater distance than in real life for those colours to start merge together. The step by step guide I outline below helps to deceive the eye to overcome the effect of colour not scaling. Note: the illustrations below were produced quickly on some spare building sheets rather than representative of greater time taken on a building itself. Firstly, for light coloured mortar, I cover the wall in my chosen mortar colour, in this case usually Humbrol 121, and whilst still, wet wipe the paint off the brick faces. If I was wanting a dark mortar course colour I would do this step last after the dry brushing step has fully dried, again rubbing off the excess mortar colour off the brick faces. This also has the effect of darkening / weathering the overall brick colour. Secondly, I pick out individual bricks in a variety of colours using Precision Paints light brick red, dark brick red, blue, orange and even black and mixes of them too. These colours should reflect the colours that are found on the prototype wall that you are wishing to emulate. Different areas / ages of wall will have a different variety and range of individual brick colours. Stage 3: Overall brick colour is dry brushed at 45 deg across the brick faces. Note: the photography this close up is quite cruel. 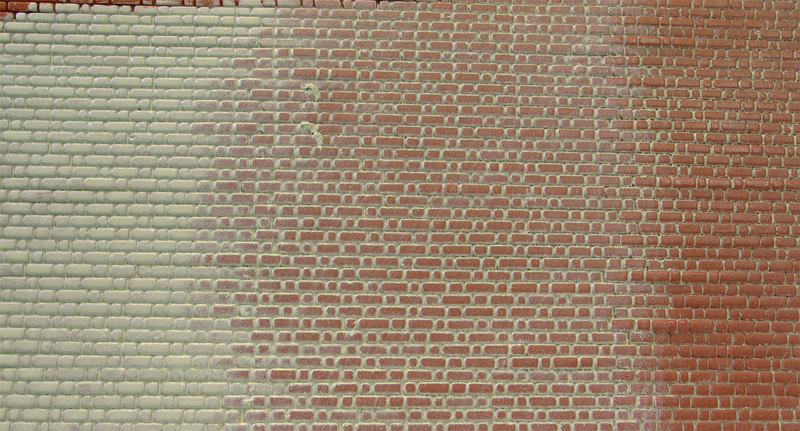 Lastly I dry brush a mix of the Precision Paints Light and dark brick red and Humbrol brick red at 45 degrees to the mortar course over the entire wall over the top of the previously individually painted bricks. The 45 degree angle is key as this ensures the paint is applied to the brick top surfaces and does not fill the mortar courses. You can slightly vary the mix of this to colour as you go. After this stage is dry then weathering cane be applied such as water staining, smoke staining, algae etc. The water tower on Fisherton Sarum viewed from a greater distance showing the more uniform colour effect. 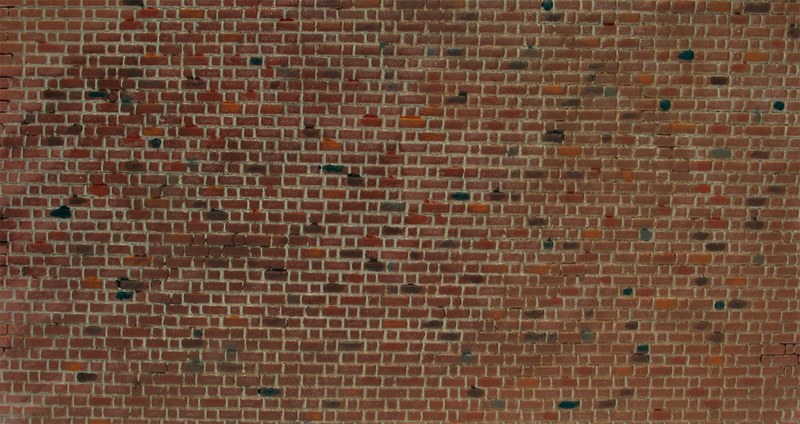 The effect of the dry brushing over the top of the entire wall is that when you view from a distance the wall colour appears almost uniform as discussed above, however as you get closer the colour of the picked out bricks shows up and provides the variety you get close up to a real wall. If you just pick out individual bricks with differing colours over the whole wall without the top dry brush in my opinion the individual colours still stand out too much especially when viewed from a distance. This method is a variation on that used by excellent modeller Iain Rice in his book “Modelling with Plastic Structure Kits” published by Wild Swan. Like many things with modelling, this is just one way of doing and the way I prefer to use, there are other ways and other approaches successfully used by many other modellers. 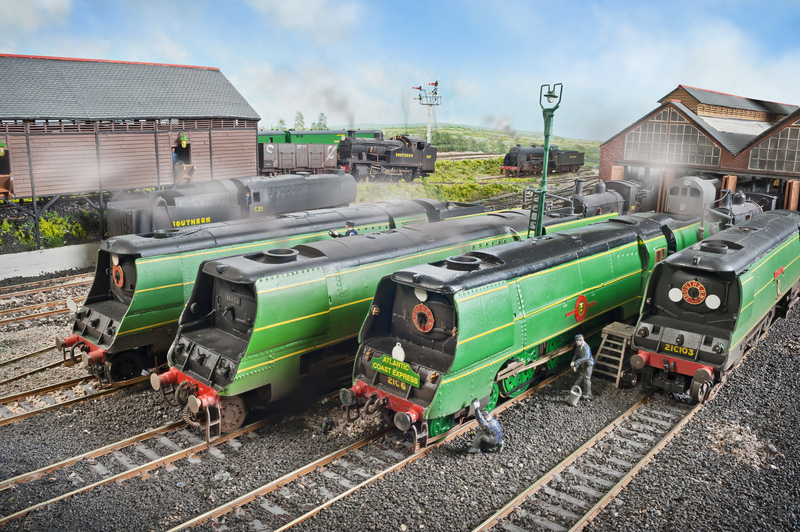 Fisherton Sarum is set in the time when many boys, if asked about a career, wanted to be an “Engine Driver”. The dream of becoming a Driver in charge of crack express such as the ‘ACE’ or ‘Devon Belle’ whilst understandable, was not in those days a quick or easy process. For nearly all such drivers the first step on the ladder, often literally, maybe for boys as young as 14, was that of ‘Engine Cleaner’. Cleaners aptly at work on the side of Bullied West Country Class 21C102 ‘Salisbury’. There wooden steps / platform is being put to good use. This initial role that included other shed duties such as fire raising, assisting fitters and boiler smiths (with the usually very dirty and less than glamorous tasks) would be for well over 12 months. After which, without any formal additional training they might be examined by the Locomotive Inspector and upgraded to being a ‘Passed Cleaner’ This new rank enabled them to be utilised by the shed foreman for firing turns on shunting duties and sometimes local goods trains. Eventually after such turns the Passed Cleaner would gain further promotion to Fireman and would then have to work up through the rosters known as ‘Links’ before becoming a top link fireman for express services. Then progress onto Passed Fireman and ultimately Driver starting once again in the bottom link before eventually progress up the links to be able to drive trains such as the ‘ACE’ or ‘Devon Belle’. Progress up all the links whether a Fireman or a Driver was often slow and often relied on members of links above you retiring or moving on. 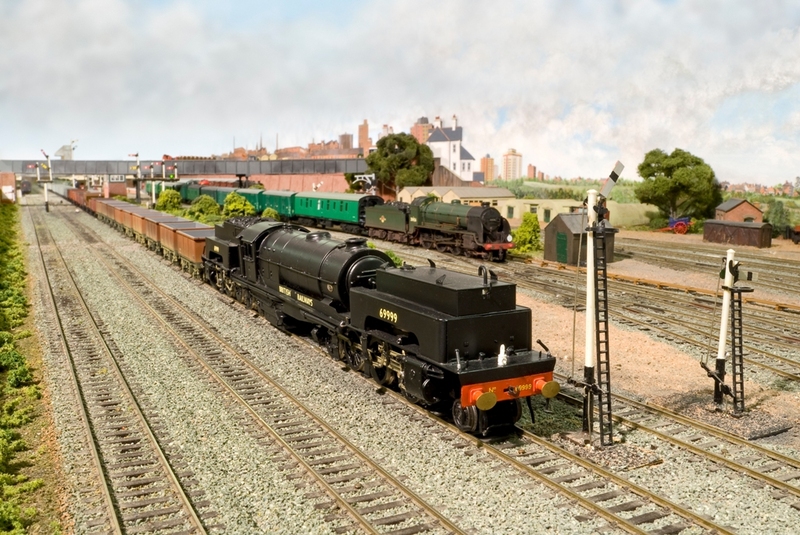 Merchant Navy 21C6 received attention from the Fisherton Sarum Engine Cleaners before its next turn of duty on the Atlantic Coast Express. I have a number of Cleaners going about their duties on Fisherton Sarum. Most are from either the Dart Castings or G T Stevens Model Railways range of white metal castings, suitably painted. 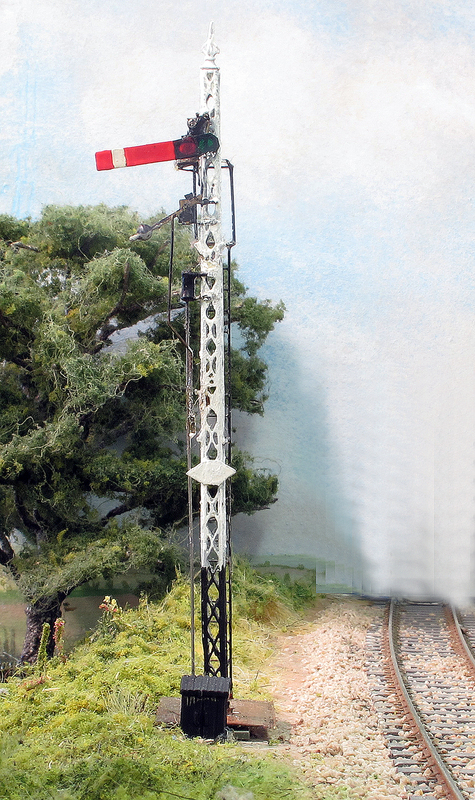 Following the introduction of the air smoothed Bulleid pacifics, ladders and or platforms were required, both for cleaning and filling the sandboxes, and these often were made from what ever materials the shed had available or could get hold of at the time. A particular pet hate of mine is viewing layouts that have no backscene, even simple a plain blue or grey painted back board is better that nothing. The last thing I want to see is the clutter behind the layout and the midriffs (being kind) of the operators. A good backscene helps create impression of depth and finishes the overall illusion that we are trying to create with a layout. There are a number of methods that can be used to create the backscene from the simple single colour plain painted board to full wrap around photographic images that are now being very successfully used on layouts such as: Chris Nevard’s Catcott Burtle, Paul Marshall-Potter’s Albion Yard and the RMweb team behind Black Country Blues. In between these two extremes variations include: fully hand painted, commercially available printed or photographic images such as available from PECO or International Models. 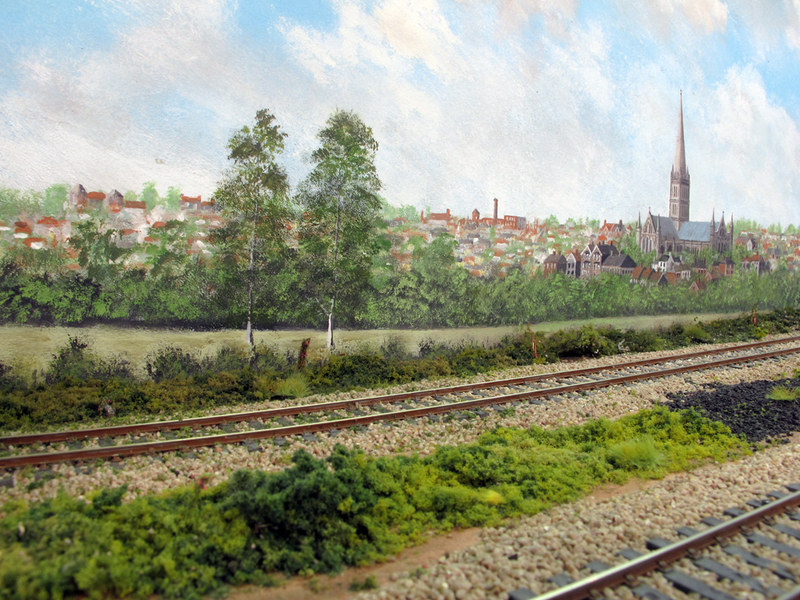 On Fisherton Sarum I am indebted to fellow High Wycombe and District MRS member Ron North who, from a couple of grainy black and white images of the rooftops of Salisbury and its cathedral, kindly and superbly hand painted my backscene. 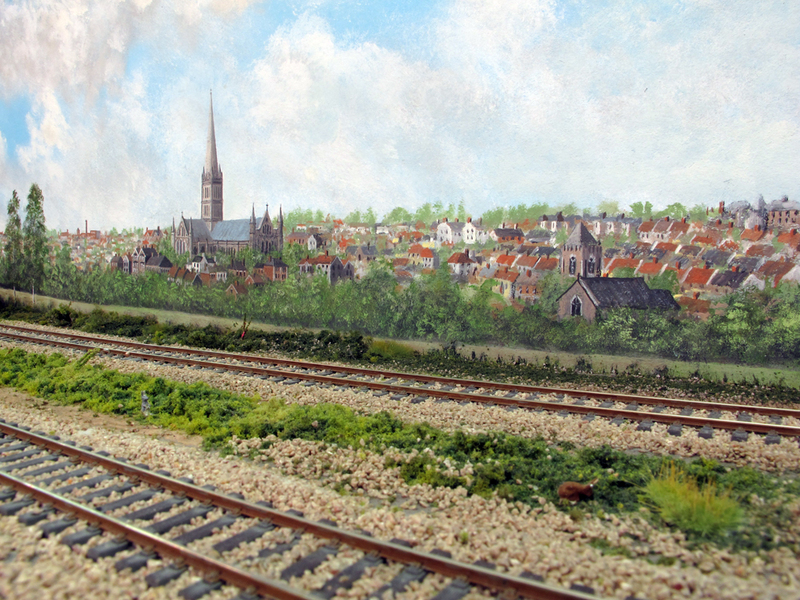 This not only uniquely helps create the illusion I was after but also places the layout as being based on Salisbury so well, even if we have moved the cathedral to the north of the line! In addition to the hand painted scene, at the western end of the layout I have a row of low relief terraced cottages backing on to the line that have been constructed from Langley Models vacuum formed mouldings suitably painted and detailed fixed to the backscene. 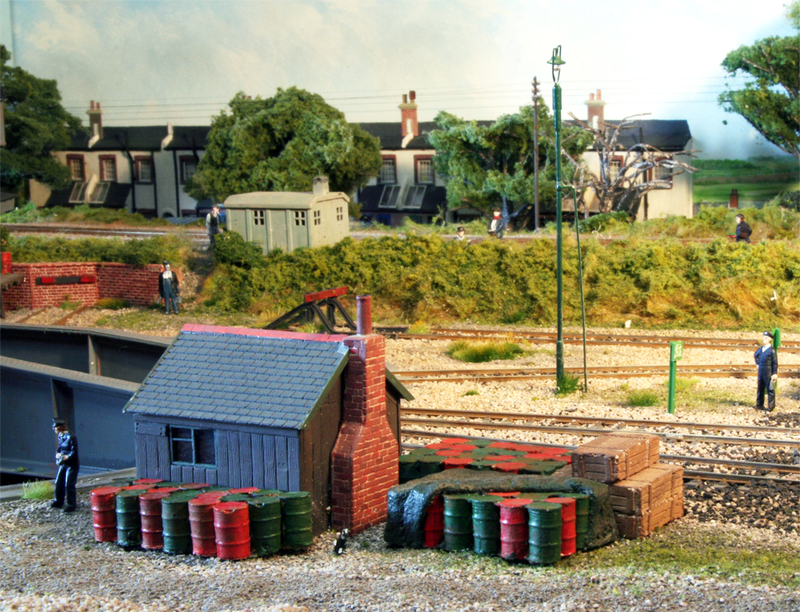 Their back gardens and yards are on the layout itself. The illusion of depth is further maintained by avoiding where possible sharp angles between the back of the layout and the backscene itself. This can be achieved by a number of tricks such as; curving the ground level up on the backscene, carefully placed fences or hedges, or the use of perspective with slightly smaller scale models just in front. It is also good practice to avoid things roads meeting the backscene at or near 90 degrees as this is very difficult to blend with a backscene (it is better to curve the road into a backscene to allow the actual join to be concealed behind a hedge or similar). 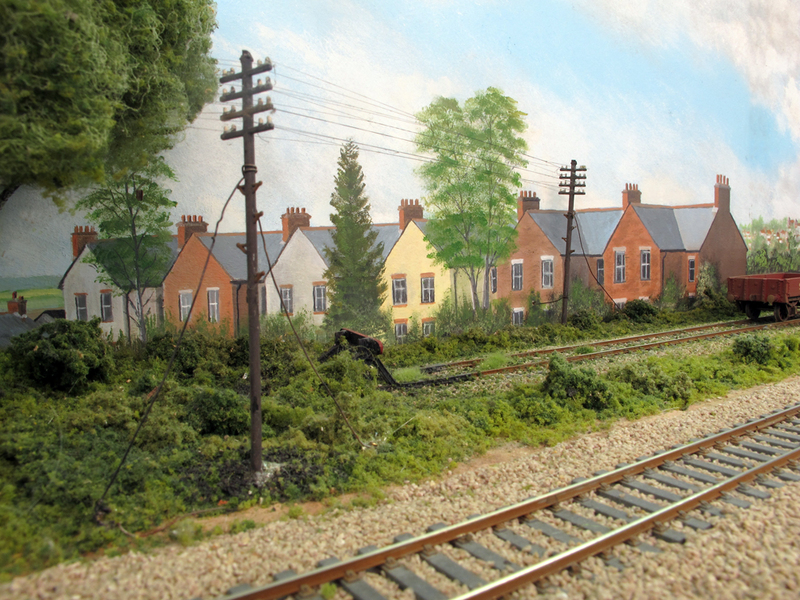 Away from Fisherton Sarum on Hinton Parva a 32’ long exhibition layout of the High Wycombe and District MRS a number of different techniques are used including hand painted sections, low relief retaining walls, fencing to hide the joins and also to help with the creation of depth the PECO printed sheets were fixed to 2mm mounting board to lift them slightly from the surface of the painted sky. To avoid too much repetition with the townscape over the length involved the PECO sheets were modified to remove some of the obviously repeating items such and chimneys, gas holders and church spires etc., even some of the buildings were reduced in height by a story or two! The London South Western Railway (LSWR) first started using pneumatic control, rather than traditional wire and point rodding, at Grateley in 1901, utilising the system from the British Pneumatic Railway Signal Company that used low pressure air at 15psi to operate the signals and points. Following this successful trial Salisbury station, that was in the process of being rebuilt at the time, was also so equipped with the two new boxes, Salisbury East and West both containing a 64 slides frame (slides replaced levers on such system). Air compressors and reservoirs were located next to each box. The system was brought into use in November 1902. Unlike the systems installed at Grateley (1915), Baskingstoke to Woking (1966) , Staines (1930) and Clapham (1936) the Salisbury system remained in service until 1986. 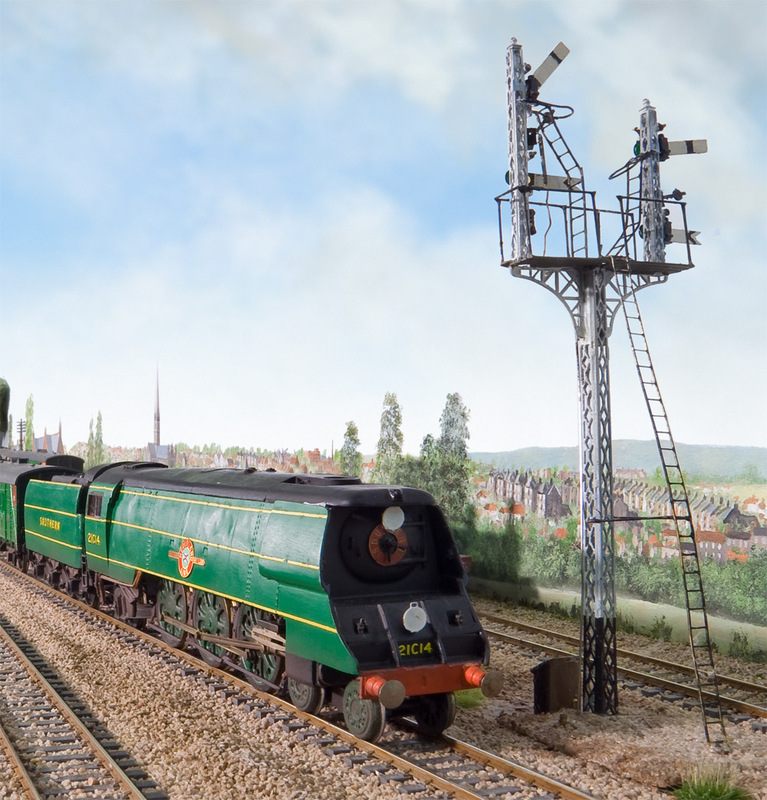 The two signals on Fisherton Sarum are based on the down advanced starter and the up inner home bracket signal for the approach to either platform 1 or 3. Andrew Hartshorne proprietor or Model Signal Engineering, from photographs of the actual two signals, kindly provided me with the correct combinations of his kits and parts to most economically make up the signals. I have also included a representation of the air cylinder mounted just below the balance arm. Each signal is operated via a Viessmann stall type motor mounted directly beneath the baseplate that the signals are constructed on and this allows the signal to removed from the layout for maintenance if required. Unfortunately it appears that these motors no longer are available and I would therefore think about using a slow motion stall motor type turnout motor in the future. 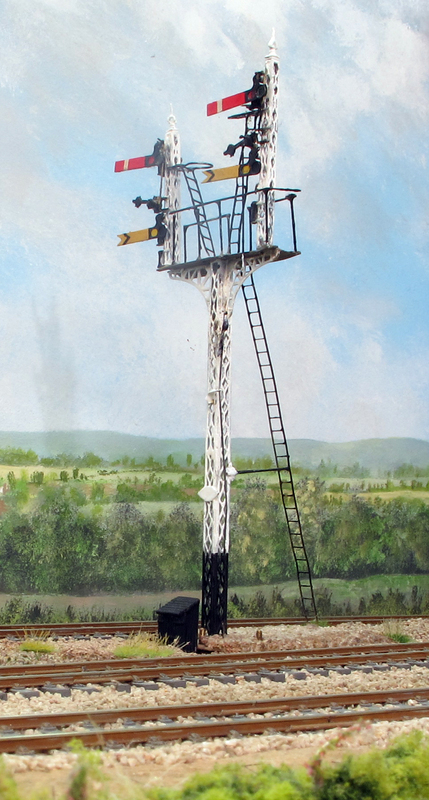 As the mentioned above the signals at Salisbury were pneumatically operated and therefore did not exhibit any ‘bounce’ so this was not incorporated into the control system. I think it always good to see working signals on any layout, although a little fiddly to build the effect is well worth the time taken. Each signal is also interlocked with a track section next to it to prevent any passing of the signal at danger. On Fisherton Sarum it is usually the fiddle yard operator that drives trains towards them so there is a switch on each of the fiddle yard local panels to operate the signal. This switch is duplicated on the main control panel with a ‘local /remote’ switch to dictate which of the switches operates the signal. For those interested in finding out more about the low pressure signalling system I suggest readers join the South Western Circle as following an excellent talk at one of the Society meetings earlier this year, Stuart Isbister has agreed to write a Circle Monograph on the subject. As the Monographs are issued free of charge to members, in addition to the quarterly Circular publication, they are usually worth the membership fee alone!